Pope Pius IX, Giovanni Maria Mastai-Ferretti, was elected pope on 16 June 1846. His pontificate was to break all records as he guided the universal church until 7 February 1878— a whole thirty two years and seven months. The revival in religious life in the nineteenth century European world is reflected, amongst other things, in the number of new sees that he founded. During his pontificate, Pius IX founded 29 new Archbishoprics and 132 new Episcopal Sees. Amongst the latter is the diocese of Gozo. The island of Gozo is the second largest island of the Maltese archipelago. It is situated 6 km northwest of Malta and covers just 67 square kilometres. However, the islands are strategically situated in the very centre of the Mediterranean 80 km south of the nearest landfall in Sicily, and 298 km north off the African coast. Gibraltar is 1836 km to the west and Alexandria, Egypt, 1519 km to the east. Its population stands around 29,500, fifth of whom live in the capital Rabat. The island of Comino, situated almost midway in the Gozo—Malta Channel, is considered part of Gozo for both civil and religious purposes. Gozo has been inhabited for the last 7000 years gaining a succession of different but related names. It is locally known as Ghawdex. Though part of Malta, it remains essentially different with its own particular traditions and cultural variations. The stretch of sea that separates Gozo from Malta is a mere six kilometres wide, but the difference between the island and the islanders was not insignificant. This was especially due to the poor means of communications that, until quite recently, could be disrupted for days due to rough seas. A journey from Gozo to Malta was an adventure that many people never thought of undertaking during a whole lifetime. Depending on the winds, the sea voyage could take up to four hours one-way as the main harbour in Malta was on the other side of the island. Gozo and Comino were part of the diocese of Malta. However, due especially to the very poor means of communications the bishop of Malta rarely visited these islands. With a steadily growing population and an increase of burdens and problems, the visits of the bishops to Gozo became more and more rare. A bishop or two, in fact, never set foot on the island. Gozitan priests and people had to recur continually to the bishop of Malta and the multiform problems ensuing convinced them that the only solution was a bishop closer home. For sixty six long wars, priests and people united their efforts towards that end. The first request for the establishment of a diocese was forwarded on 30 October 1798. The Gozitans implored King Ferdinand III of Sicily, then formal sovereign of the Malta and Gozo, to grant permission for the establishment of a bishopric on this island and to seek its approval from Pope Pius VI. Yet the difficult times of the Napoleonic wars impeded further progress. On 30 December 1836, three representatives of the Gozitans personally presented a second petition to Pope Gregory XVI in which they again beseeched the Pontiff to be kind enough to dismember the islands of Gozo and Comino from the Diocese of Malta and erect them into a separate diocese. As Malta and Gozo were then a British Crown Colony, the Gozitans also petitioned King William IV of Great Britain to further their cause and begged the Governor, Sir Henry Frederick Bouverie, to give them his support. No further progress was made. The project met the aversion of the bishop of Malta. Besides, at the time, the British Secretary of State for the Colonies and the papal Secretary of State were in a diplomatic tug-of war concerning the right of presentation to the Malta bishopric. The question was being shelved for another reason. No one at the Vatican ever interested himself in the petition presented to the Pope, so much so that it got lost. The erection of a tiny island into a diocese was too minute a problem to arouse any interest at the Vatican. Indifference, indecision and indefinite delay were destined to characterize the Gozitan affair at the Vatican for many a year. After eighteen years, the Gozitans decided to tly again and to go straight to the head to explain matters as clear as possible. On 9 June 1855, a delegation representing the priests and people of Gozo made up of Canon Precentor Michelangelo Garroni, Canon Gaetano Bondi and Don Pietro Pace, had a private audience with Pope Pius IX. An aide-memoir on this audience is recorded in a petition that followed days later (AES. M III, 92/60, 2r-7 r). 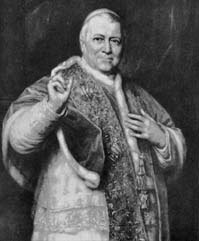 Pope Pius IX found time to listen attentively to their request and, “with all his natural kindness and paternal tenderness — con quella benignità e paterna dolcezza che l’è proprio, accolse la domanda meramente verbale”. The Pope understood the pastoral and spiritual problems that the Gozitans were facing on a small and isolated island and conceded their wish by word of mouth. The Pope, troubled by a hundred and one problems of the Italian Risorgimento, found some of his precious time to dedicate to the Gozitan delegation, to think about their plight, to understand their difficulties, and to offer a solution. Pope Pius IX succeeded in a few minutes to offer hope and suggest a solution to a problem that had been in abeyance for fifty seven long years. “ …una forte emotivita, accresciuta dai disturbi giovanili che lasciarono una certa traccia sul suo fisico; una cordiale bonta di cuore, pronta a farsi tutto a tutti nei limiti del possibile, unita ad un’istintiva, irrefrenabile arguzia, che, se talora offendeva qualcuno, piu spesso rendeva simpaticissima la sua compagnia; un robusto buon senso ed equilibrio, incline a cogliere al volo i lirniti delle situazioni e non scevro da una punta di scetticismo; un certo talente amministrativo, più tardi uffinato dall’esperienza, più orientato però verso la gestione ordinaria. che portato a formulare piani a lunga scadenza. radicali, ampi; un’intelligenza più pratica che speculativa, più portata all’azione, che alla speculazione.” (GIACOMO MARTINA, La personalità di Pio IX, in AUBERT — MARTINA, Il Pontificato di Pon IX. 840-841). Odo Russell affirmed that the Pope means what he says. It is certainly true as regards the question of the establishment of he diocese of Gozo. From the moment that he became aware of the problem, the kind, helpful pontiff promised his support and, at the end of the audience, he himself directed the Gozitans to the Congregation of Extraordinary Ecclesiastical Affairs to press for the commencement of the necessary procedure. The Gozitans reminded him: “Era forse riserbata a Voi, Santo Padre la gloria di consolarli, e di aggiungere a tante glorie dell’immortale Vostro Pontificato questa ancora di provvedere al bene di tante anime Cristiane. che hanno tanto maggior bisogno di aiuto spirituale, quanto sono oggi le mene dell’incredulitã e del protestantesimo per abbattere l’unica, vera, e santa nostra religione.” Divine Providence had reserved to him the honour to appease the suffering of the Gozitans. Yet nothing was done until the Gozitans solicited the Holy See with a follow-up petition. The Pope was again informed on 3 October 1855. Once again he agreed with what the Gozitans were beseeching. (Ex audientyia SS.mi, 3 October 1855, AES. M III, 92/60, 16r-17r). The establishment of a diocese involved several Congregations of the Roman Curia and a very lengthy procedure. Among those who took interest. Giovanni Battista Cannella. the Secretary of the Congregation for Extraordinary Ecclesiastical Affairs, must be singled out. He became the most reliable counsellor of the Gozitans offering solutions to all problems that cropped up. It became clear by the passage of months that the Holy See was only ready to concede an Auxiliary to the bishop of Malta with instructions to reside in Gozo. The creation of such a small island into a diocese seemed out of question, notwithstanding the compliance of the Pope with such a concession. It was Cannella who continued to back the Gozitan request, which was again shelved for some time. At the beginning of August 1857, Don Pietro Pace once again sought and was granted a private audience with the Pope. During that meeting he once again solicited an early solution. Pope Pius IX intervened a second time and the affair was set rolling again. However, Cannella fell ill some time later and eventually left the Secretariat. At the same time, Giacomo Cardinal Antonelli explained to Odo Russell that the problem of Gozo had to be postponed again and again as “they were engaged upon other subjects of more immediate importance” (ODO RUSSELL to Lord Russell, 3 May 1861. PRO, FO, 43/83A. no 52). As Giovanni Perrone, the Jesuit, put it to Don Pietro Pace, “all the world was upset”, the whole Italian peninsula was in turmoil (GIOVANNI PERRONE to Pace, 5 May 1859, AAM, PPP). The Gozitan question had to be put aside. Cannella was succeeded as Secretary of the Congregation for Extraordinary Ecclesiastical Affairs by Giuseppe Berardi, who remained there for a short time. On 31 October 1860, he was succeeded by Alessandro Franchi. That appointment was advantageous to the Gozitans as Franchi had been acquainted with the question by the British representative, when he was still Apostolic Inter-Nuncio in Florence. Pope Pius IX and the managing of affairs by Franchi eventually led to a successful conclusion. Through his constant direction and support, the Gozitans began to seriously tackle all related problems. First, they succeeded to gain the unequivocal approval of the British Colonial authorities; they provided an appropriate endowment for the bishopric; provided the right candidates for the bishopric of Gozo; and prepared for the setting up of a seminary — then a sine qua non condition in the establishment of every diocese. The last obstacle to be overcome was the aversion of die Maltese hierarchy, unwilling to part with a section of its territory for the creation of a new diocese. In a final attempt to hold the proceedings, a lot of antagonistic writings were exchanged with the Holy See. In his moment of truth, the kind pontiff once again intervened in person to comply with the righteous and just wishes of time Gozitans. In May 1862, Gaetanio Pace-Forno, the bishop of Malta and Gozo, who with his Maltese counsellors was the final hurdle in the fulfillment of the Gozitan wishes, travelled to Rome to present the Pontiff with and address signed by 54,000 Maltese showing their adherence to the papal policy in the question of the Risorgimento as well as to attend the canonization of the Japanese martyrs. On 17 May 1862, he was received in a private audience by the Pope. The Pope was overjoyed with the “splendid and distinct testimony of Your homage and devotion towards us and the Apostolic See”. However, he did not fail to invite Pace-Forno, to say the least to change his attitude towards die Gozitan affair. He firmly asked him, without mincing words, to terminate his opposition to the Gozo diocese. Referring to the audience a year later. Pace Forno himself wrote that in that audience, “anzichê conforto, ebbi un accoglienza si tornentosa, che fino al giorno d’oggi mi scappano le lacrime ogni volta che vi penso seriamente — instead of a pleasant meeting, I had so tormenting a reception, that to this day I break in tears whenever I seriously think about it, (GAETANO PACE-FORNO to [Ferrari, Under-Secretary of State], 13 June 1863, AES, M III, 92/61, 104r). The Pope kept his promise of 9 June 1855 to the Gozitan delegation. Gozo would indeed be established a diocese. Events hence quickly headed to a conclusion, On 16 March 1863, Michele Francesco Buttigieg, Archpriest of the Gozo Matrice and the person who was suggested by the Gozitans as their first bishop, was elected Auxiliary Bishop to the Bishop of Malta with instructions to reside in Gozo. It was the penultimate step. On 14 July 1864, the Holy See initiated the proceedings for the eventual establishment of the diocese. On 14 September, Archbishop Franchi briefed Pope Pius IX on the final developments, He formally and happily conceded to the erection, Through the Bull Singulari Amore — With Remarkable Love of 16 September 1864, Pope Pius IX established Gozo and Comino a separate Diocese directly subjected to the Holy See. News of the establishment of the diocese reached Gozo on 23 September. People of all ages and from all walks of life rushed to the new Cathedral kissing and embracing a marble bust of Pope Pius IX “the author of such unusual joy”. The bust, sculpted in white Carrara marble by Mario Gori of Rome, had been raised on a plinth on the Matrice presbytery the previous April. On 22 September, Bishop Michele Francesco Buttigieg was elected first bishop of Gozo. On 23 October, he made his joyous entry into the new Cathedral amidst the deafening cheers and enthusiastic applause of his devoted flock. Pope Pius IX had indeed shown remarkable love to tiny Gozo, It is here that his greatness lie. Though pastoral leader of the universal church and, at that time, king of a territory bursting with problems, be succeeded to find space and time in his mind and heart for a few thousand souls suffering spirituallv in a mid-Mediterranean island. He promised a solution and, for tree times, he directly involved himself to overcome the cropping problems. Indeed, Pope Pius IX succeeded to meet the wishes of a minute part of his universal flock with remarkable love. On Sunday, 3 September 2000, Pope Pius IX was declared a Blessed by Pope John Paul II during a ceremony at Saint Peter’s Square in the Vatican City.